Salad mayonnaise is distinguished from real mayonnaise by its oil content. The former generally has a 50% oil content, while real mayonnaise is traditionally closer to 80%. Salad mayonnaise is a versatile dressing which can be placed between layers of salad or on the side to add succulence and flavour. In Germany, it is squeezed over french fries in the same way that ketchup is used. It should preferably be enzyme stable, with water uptake capability for when it is layered on salads. This isn’t necessary if the product is to be used as a table mayonnaise. Ideal product characteristics include a creamy taste and smooth texture. KaTech can work with you to develop a salad mayonnaise with the characteristics you are looking to achieve. Our new product development team has the expertise needed to create different mayonnaise products suitable for a variety of uses and purposes. Ultimately, it is these different end product uses which determine the form the mayonnaise should take. Mayonnaise used in a layered salad, for example, should be enzyme stable to avoid water seepage. This requires a minimum hydrocolloid element, although clean label versions can be developed for shorter shelf life end products. Different possible fat contents can also be explored. The traditional versions have a 50% oil content but lower fat levels, of 35% and 25% oil, are also acceptable for all uses. If you would like to develop a new product then get in touch with us via the contact page and we will get your solution underway. The oil range of 20 – 50% is the popular arena in which a lot of development activity is concentrated and many problems can arise relating to mouthfeel , loss of thickness and body. 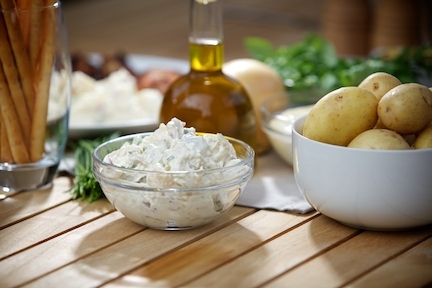 Many different kinds of oils and flavours are employed to introduce flavour enhancements and points of difference to existing mayonnaise products which can disturb the balance of many systems. This is also the area where clean label ingredients are most intensely applied and the texture and mouthfeel are sometimes compromised. KaTech have worked in the clean label arena for many years and many new raw materials and techniques have evolved to improve the texture of starch only thickeners to return the mouthfeel from the sticky ‘vaseline – like’ to the more pseudoplastic melt in the mouth requirement. This is the most popular area and, therefore, subject to intense price competition. The product must be manufactured to the lowest cost but should also aspire to achieve a quality profile reflecting minimum compromise to the existing product. Contact us to discuss how we can help to make your product more competitively priced.